The USD 2.6 billion Stand-By Arrangement (SBA) Facility will strengthen future economic activities in the country said Governor Central Bank of Sri Lanka Ajith Cabraal. Cabraal said with the dawn of peace there will be more economic activities happening in the country. 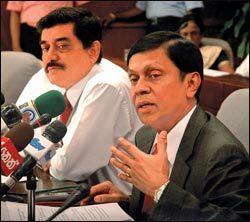 In March 2009, Sri Lanka sought a SBA facility with exceptional access from the IMF amounting to USD 1.9 billion, 300 percent of country's current quota. But with the IMF consultation we went for USD 2.6 billion accounts for 400 per cent of the country's current quota with the Fund and is the highest ever facility offered by the IMF to Sri Lanka. Increase of the amount to USD 2.6 billion from USD 1.9 billion will facilitate the future economic activities which will be on the rise. We need to facilitate these economic activities and increasing the amount of SBA facility was a long term plan, he said. The approval of the SBA facility on July 24, 2009 is an endorsement of the country's economic policies by the IMF as all macroeconomic policies and targets under the 20-month program are in line with policies already implemented and announced by the authorities. The Government's budget deficit for 2009 is expected to be 7 per cent of GDP under the program. The fiscal consolidation path accommodates expenditure for relief, rehabilitation and reconstruction of the conflict affected areas while protecting social expenditure such as expenditure for health, education and Samurdi payments. It is also strongly believed that the endorsement of the Sri Lankan authorities' policies by the IMF would boost investor confidence in Sri Lanka and enhance the country's ability to attract local and foreign investment as well as loans from bilateral and multilateral agencies. These investments could be channelled for infrastructure development and for the post-conflict reconstruction and relief effort, thereby increasing the country's production and job creation in the long run and lay the foundation for future economic growth and enhance macroeconomic stability. Repayment of the loan will commence on April 2012. The loan is repayable within 4 years commencing April 2012. The rate of interest of the SBA facility is composed of two components; the service charge and a fixed margin. The service charge is calculated weekly, based on the SDRs rate (which at present is 0.3 per cent per annum) while the fixed margin is 1 per cent per annum for the outstanding loan amount up to 300 percent of the quota. When the outstanding loan amount exceeds 300 per cent of the quota, a surcharge of 2 per cent per annum is to be levied. The interest rate of the SBA facility is significantly lower than the prevailing market rates.